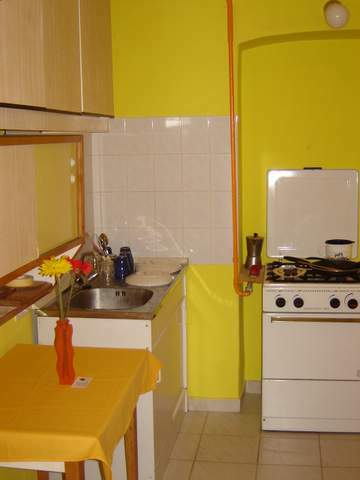 A nice cheap apartment (max 4+1 persons: one twin and one double room) downtown Budapest! Equipped kitchen and bath with bathtub! Almost for free! If you wanna go really private, make your woman or man cook for you, later just want to have fun in the bathroom's bathtub, or simply have party all day long with your friends, you got to book this apartment. 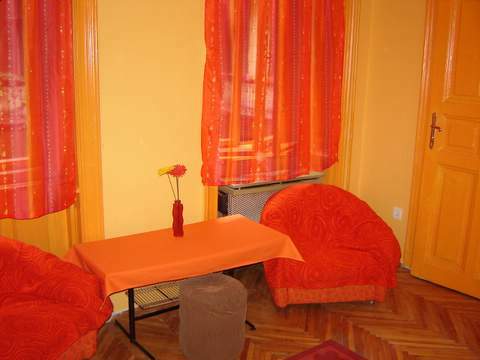 At your arrival to Budapest we would like you to come to Amigo Hostel & Guesthouse (Address: Hungary, Budapest, VI. ker.(distr. ), Liszt Ferenc tér (sq.) 4, 1st. floor, door no. 4), where from you will be escorted and helped with your luggage to the apartment which is 6 min. away if we take the tram for one stop or 10 min. by walk from the guesthouse. 7-th bus >> Blaha Lujza tér >> Tram no. 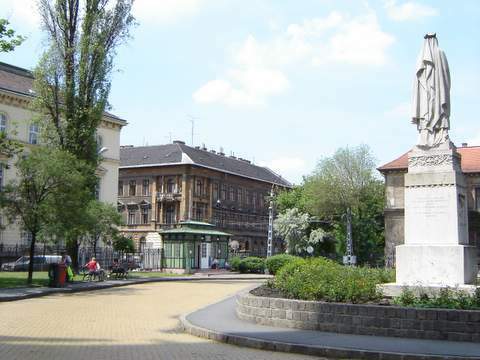 4 or 6 >> Oktogon stop The hostel is at 3 min walk from the Oktogon stop. Trip time: approx. 20 min. Tram no. 4 or 6 >> Oktogon stop. The hostel is at 3 min walk from the Oktogon stop. Trip time: approx. 5 min. Metro 2 (red line) to Deak ter >> Underground (yellow line) to Oktogon. The hostel is at 3 min walk from the Oktogon stop. Trip time: approx. 30 min. Metro 3 (blue line) to Deák tér. >> Underground (yellow line) to Oktogon. The hostel is at 3 min walk from the Oktogon stop. Trip time: approx. 35 min. Check in: from 11:00h(11 am)* till: as per the time advised by you! If you can not be at the hostel at about the estimated arrival time you have given us on the booking enquiry, please try to call us at least 1 hour before your arrival to the hostel(/Mob: 00 36- 20-332-6322/ - currently there is no non-stop reception and we may not be at the hostel just then) or much better: try to advise your new arrival time in advance. You can advise arrival time from 9 am to leave your luggage at our hostel, but you can occupy your room from 11 am only. Check out: till 10:00h (10 am) There is possibility to leave your packed luggage at the hostel after 10, but only after you spoke this over with the reception. Please do not exceed the check out time as somebody is surely coming into the room. We offer you a private apartment with one double and two twin beds suitable for accommodation of 1 to 4 people*. The apartment has two furnished half-separated rooms**, a fully equipped kitchen (dishes, cutlery, gas oven, small refrigerator), bathroom with bathtub, toilet. *One more 5th touring extra bed can be required. **There are one bigger (4x4m, with two twin beds) and one smaller (4x2, 4m, with one double bed) rooms, you can reach the small room going trough the big room, so, there are no separate door entrances, but both rooms have separate door what can be closed. The apartment is on 40m2. 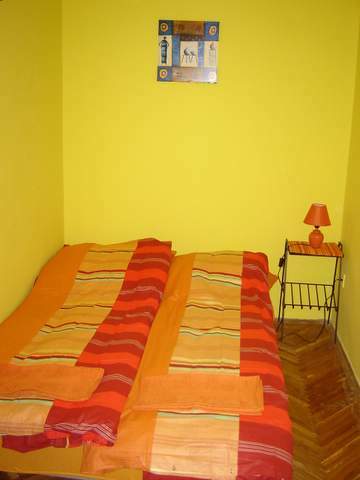 One double (2 persons) and one twin room (2 persons), plus one extra bed avaliable. All max. 5 persons can be accommodated. . 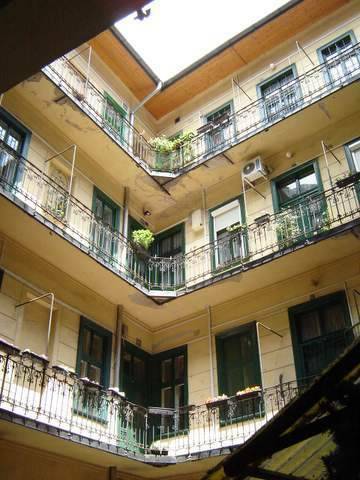 The apartment is situated at one of the cult streets of central Pest, Dohany street (translated: Tobacco street) between Keleti Railway station and Blaha square. On, or right beside this street you can find the most popular entertainment pubs and restaurant as Port Side pub, Old Man's pub& restaurant (live music every day, disco after 11pm), Harley Davidson pub (disco by night), Kulacs Hungarian restaurant and many others. Nearby you can take a look at two of the most interesting churches in Pest or visit the Synagogue (the famous Jewish church in Hungary) at the end of the street. 10-25% for long stay, groups, ect. Please contact us. Payment: Payment is in cash upon arrival in EUR or in HUF (Hungarian forints) on the base of the EUR daily Raiffeisen bank selling exchange rate. A written booking cancellation is free of charge one week before booked arrival date and time. Your cancellation will be valid only after our written confirmation of it. - in case of 5 or more than 5 nights booked: the first two nights payable by bank transfer to the hostel. OCTOGON SQUARE, we are 3 min. away from that very known square. Yellow underground, tram no. 4-6.